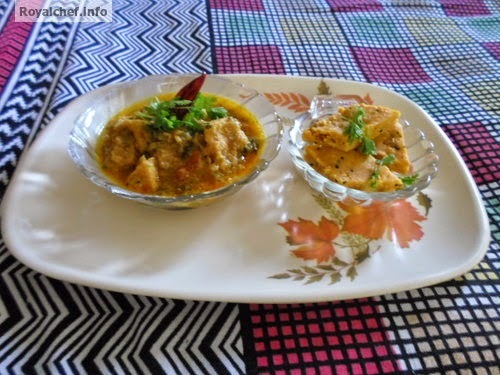 This is a Recipe for preparing at home Patodi Che Kalwan or Patodi Chi Gravy. This is a popular and traditional recipe from Maharashtra, which is a spicy and filling main course dish. 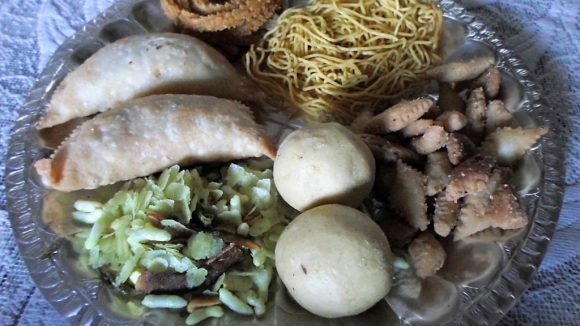 In this post, I have explained how to prepare it, in a step by step manner. For the Vadi :- In the Besan add Red Chili Powder, Turmeric Powder and Salt and add Water as required and prepare a mixture like a Pakora batter. Then heat the Oil in a Kadhai and add Mustard Seeds, Asafoetida and the Besan mixture. Mix it well and cook till it become thick on a slow flame. Then remove from the flame and keep in a plate and roll it in the same plate. The rolled mixture should be about one-fourth of an inch thick. Then cut it in to diamond shaped pieces. For the Gravy Masala :- Heat the Oil in a Kadhai and add Onion and Garlic, fry for 2-3 minutes on a slow flame. Then add Coconut and fry for 3-4 minutes and then add the Red Chili Powder, and Garam Masala. Mix it well and grind it to a fine Paste. For the Gravy :- Heat the Oil in a Kadhai and then add Onion and Tomato and fry for 2-3 minutes and then add the grounded paste and a cup of Water and cook for 5 minutes. Then add Salt and the cut Vadis and cook for 5 minutes on a slow flame. Serve hot with a Paratha or Rice.